In a large saucepan, cook onion and garlic in hot oil for 2 to 3 minutes or until onion is just tender. Stir in the chicken broth, undrained tomatoes, chili powder and oregano. Bring to boiling; reduce heat. Cover and simmer for 10 minutes. Stir in the chicken, beans, and corn. Return mixture to boiling; reduce heat. Cover and simmer 10 minutes more. 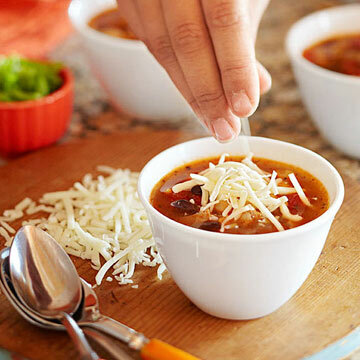 Ladle soup into bowls and top with tortilla chips, cheese, green onions and/or sliced avocado. Multiply recipe 3 times to make 6 quarts.